Kalimpong: The rebel faction of the Gorkha Janmukti Morcha formally took control of the Kalimpong municipality on Wednesday with Ravi Pradhan and Bhim Agarwal taking oath as chairman and vice-chairman of the civic body, respectively. The new civic chief said his focus would be on solving the water crisis and turning the town into a "green city". Pradhan is the councillor of ward 3 and Agarwal of ward 9 of the 23-member municipality. While Pradhan had won from the seat on the ticket of the united Morcha, which had bagged 19 wards in the civic election held earlier in May, Agarwal was one of the two elected Trinamul councillors. The other two wards were bagged by the Jana Andolan Party. However, in the wake of the recent unrest in the hills, the Trinamul councillors joined the Morcha and subsequently, 14 Morcha councillors shifted their allegiance to the Tamang-Thapa group. This led to the Morcha rebels moving a no-confidence motion against the former chairman, Suva Pradhan, on December 14, resulting in his ouster. Speaking to reporters, the new civic chief said his main priority would be to solve the water problem and turn Kalimpong into a green city. "The biggest problem facing the residents of the town is the problem of water scarcity and I, my vice-chairman and councillors will work towards solving it. As regards green city, we are already in talks with the ministers in the state government and we will work towards that goal as well." 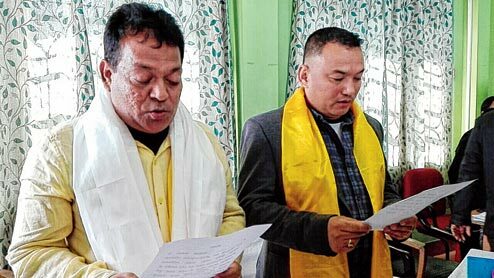 The rebel faction of the Gorkha Janmukti Morcha formally took control of the Kalimpong municipality on Wednesday with Ravi Pradhan and Bhim Agarwal taking oath as chairman and vice-chairman of the civic body, respectively.